Dark days of cold dreary winter continue here, accompanied by steady rain. As I stared at the rain spots on the window, I was glad the trees, shrubs, and BULBS were getting the water they need. There are already buds on the Erlicheer narcissus in the front under the oak trees and on the Thalia narcissus on the sloped hillside in the backyard. I thought of spring and remembered a pillow I saw online. The pillow was perfect for bringing spring inside now before its official arrival on March 20. Rather than buy that one online, I decided to create a similar do-it-yourself version. 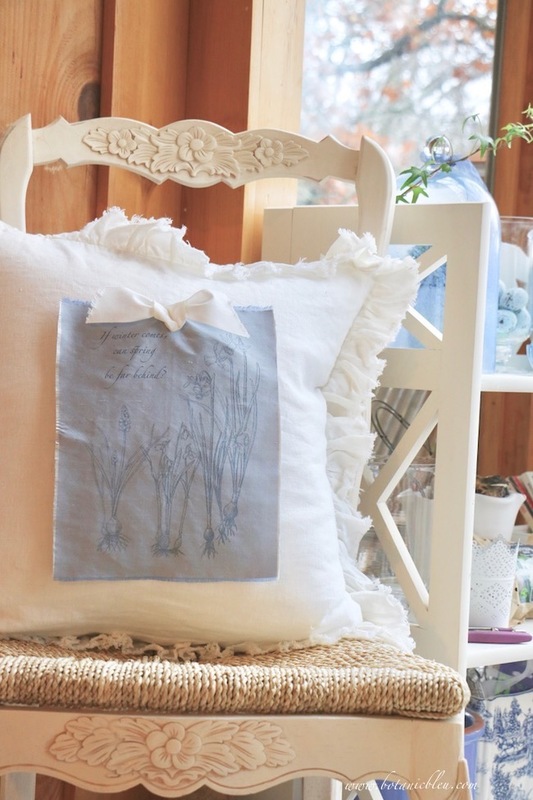 This is an EASY project that requires no sewing! A somewhat Do-It-Yourself pillow began with a white linen pillow I bought last year from The Findery in Waco. See, no sewing! The advantages of using a pillow I already have are cost, space, and ease. The cost of the new pillow design was low in both money and time. Storing the new blue silk panel takes only a little space, much less than the space needed by an entire pillow. And, making just a printed panel was far easier and faster than making a pillow cover with a ruffled edge PLUS the printed panel. There was no reason to buy another pillow since the white linen pillow with its ruffled edge was what I envisioned for the new spring bulb pillow. 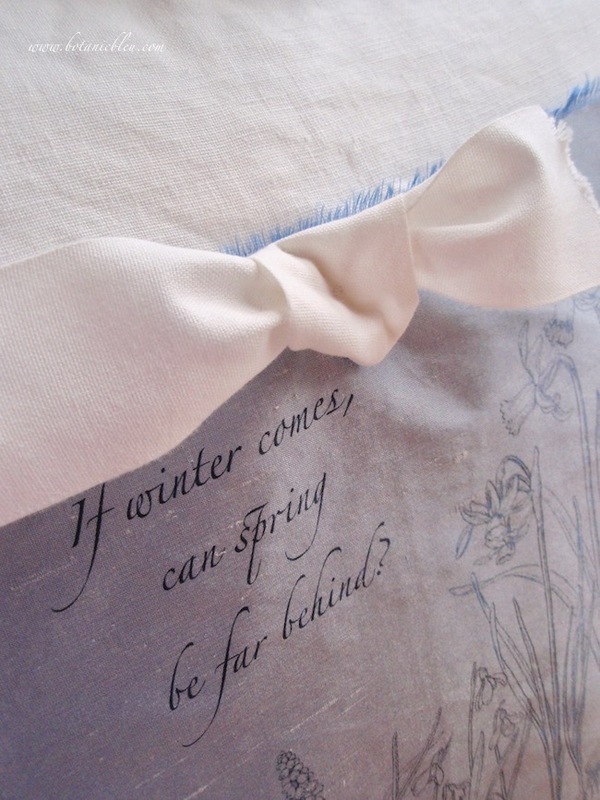 Adding a temporary DIY printed panel to the pillow allows the pillow to be used in its original form later and to have other temporary designs added at other times of the year. The blue silk fabric was left over from another project and complements the other blues in my house. Slubs in the silk and raw edges add texture. The panel is the size of a sheet of notebook paper, about 8.5"x11". Look in the remnants bin at your local fabric store for fabrics that go with your home's color scheme. Instead of using a colored panel on a white pillow, you can also use a white panel on a colored or patterned pillow you already have. Choosing this quote was easy. Early blooming bulbs pop open while it is still winter in my area, and the quote is uplifting in its message. Winter can be a depressing time, but spring brings new growth and new life. NOTE: Material published before 1923 is most likely copyright free. See Copyright - Is My Work Protected? for a summary of copyright issues for bloggers. 🅐 Compose your floral print as a DOCUMENT on your computer. 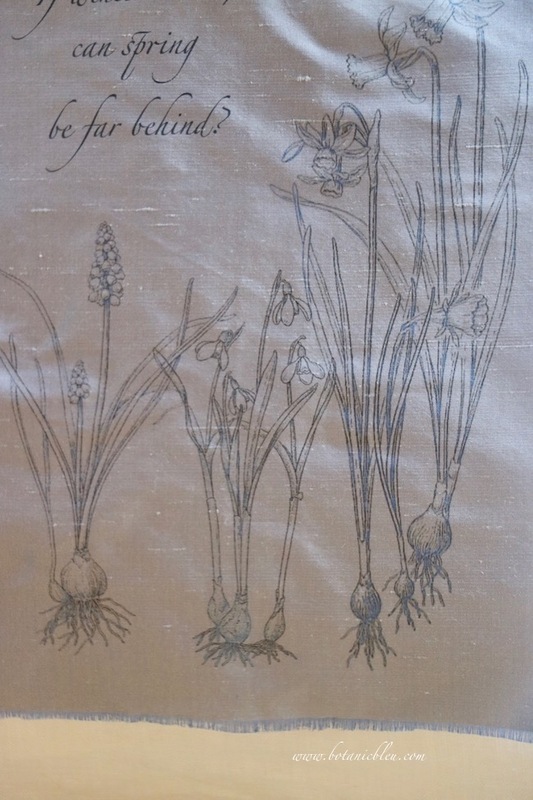 See the Graphics Fairy for spring bulb images. 🅑 Cut your fabric to fit a Full Page Label. Press your fabric to the sticky side of the label. 🅒 Print your floral document on the fabric side attached to the Full Page Label. After printing the fabric panel, remove the fabric from the label. 🅓 Iron the printed fabric panel to set the ink. Place a clean sheet of paper over the printed panel before ironing to protect your iron from ink. 🅔 Make a bow from heavy cotton twill ribbon. Cut the ends on a diagonal, and use your fingers to fray the edges. 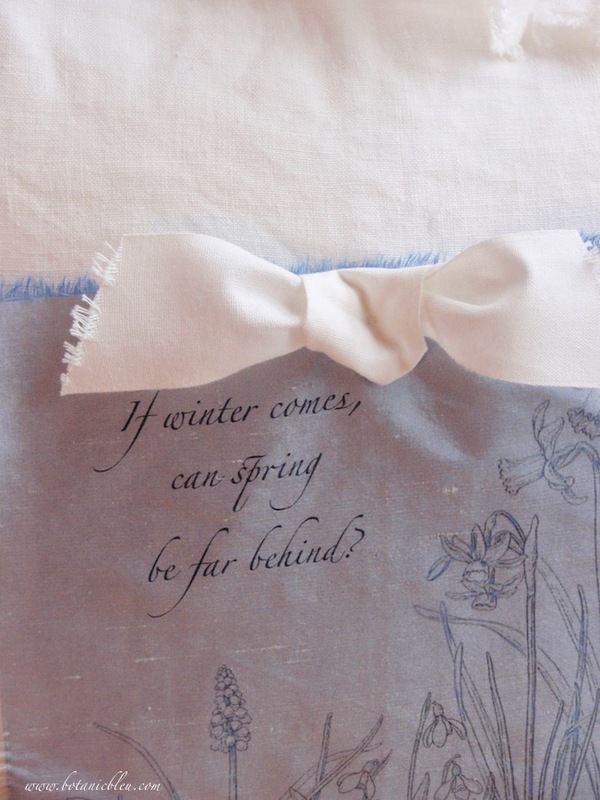 🅕 Use a safety pin to attach the bow and panel to the pillow cover. Open the pillow cover, remove the pillow, and attach the safety pin from inside the pillow cover so that it goes through both the floral fabric panel and the center of the cotton twill ribbon. Re-insert the pillow, and close the pillow back. 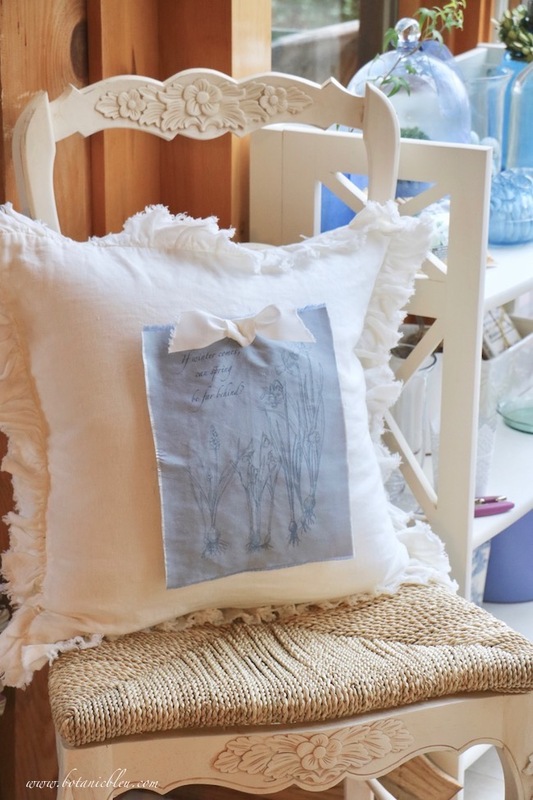 The safety pin makes it easy to convert the pillow back to a plain linen pillow. 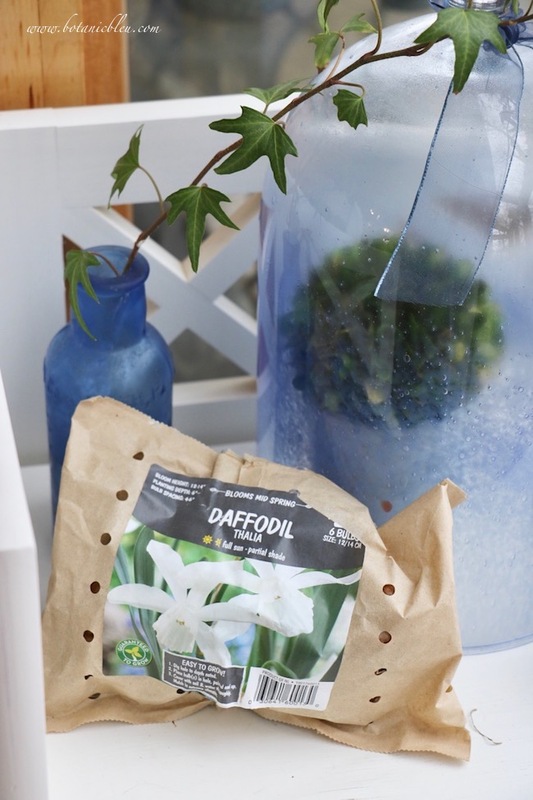 During late winter the spring narcissus pillow brightens a French-style chair near the bookshelf I use as an indoor gardening spot. The Thalia daffodil buds in the backyard will open in about a week after receiving all the late winter rains this week. 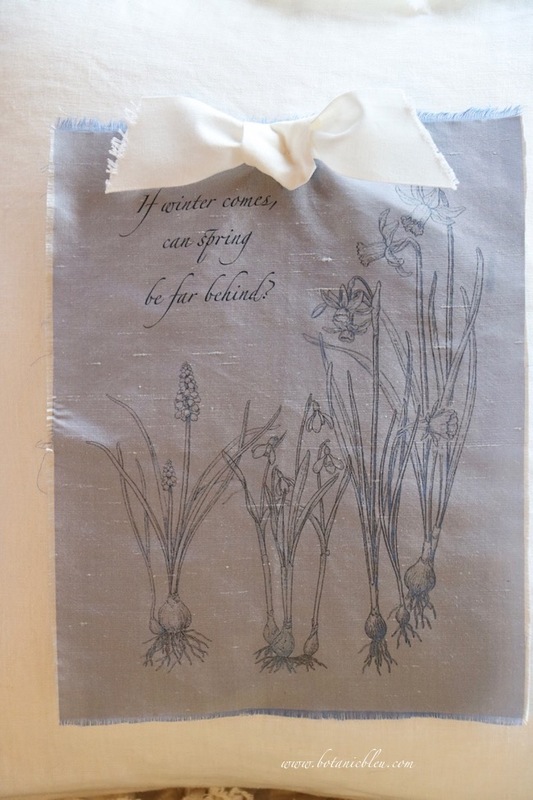 Until then, the spring narcissus pillow reminds me of the flowers to come. Soon I hope to be back on a regular schedule for blog posts. Recent events interrupted planned features, including two Valentine posts partially finished, but no longer timely for publication. My head-meets-tree-meets-rock-wall injury is almost completely healed, and was followed by a death in my family. Thank you to everyone who sent comforting condolences for the recent loss of my brother in Alabama. He always had a kind heart, helped others, and gave calm and wise counsel when asked. He will be missed by family, friends, former work colleagues, and his church family. He made a difference in so many lives in so many ways. He faced adversity with grace and strength and encouraged others by example to 'play the hand you are dealt.' A LIFE WELL LIVED. What a mix of good news, sad news and lovely creativity. I'm glad you are healing from your head injury -- never fun, always scary. That's the good news. And sad to hear of your brother. He sounds like a wonderful man and a great loss to all who loved him. That grief healing takes a long while, too, so I trust you will be very gentle with yourself during this time. But your creativity comes through and I hope that helps with healing as well. I love your upcycle of the pillow and your instructions are very easy to follow. Thank you! This is really pretty, Judith. You make everything pretty. I'm sorry to hear about your brother. Take care, Judith. I'm glad to hear your injuries are healing well too. I hope to see you blogging when you can and when you feel like it. Cute pillow. 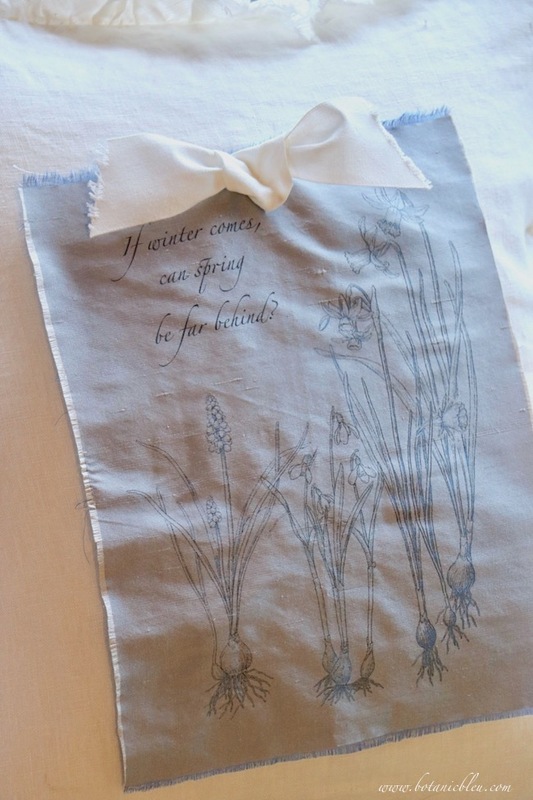 Not to skip over your loss, but I wanted to say what a clever way of printing on fabric! Thank you for sharing that! I knew you were dealing with a family crisis, and so sorry to hear you lost your brother. I had no idea you were also suffering from a head injury! So glad you’re on the mend. This is a wonderful idea for changing the entire look of a pillow, without spending a lot of money to change out seasonal decor! Your pillow is lovely, Judith. I will be looking out for special pieces of fabric to do this with. I'm so sorry for your loss. Your positive attitude is inspiring. Judith, so sorry to hear about your brother. Hope your head injury is healing well. Wishing you and your family positive thoughts.